A couple week ago, during the last debconf (Debian Conference) in Managua/Nicaragua, I presented the latest developments about the inclusion of clang in the Debian architecture. To sum up (details are available in the slides and the video), the rebuild of the Debian archive with Clang 3.1 increased the number of failures from 8.8 to 12.1%. The main reason is that further checks have been added to clang. 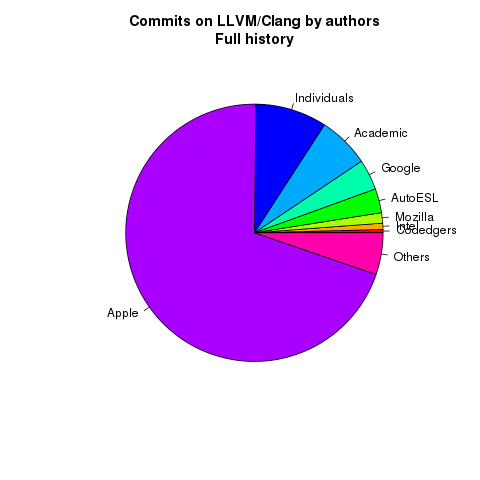 With Paul Tagliamonte as co-mentor and Alexander Pashaliyski as a GSoC student, we made great progress in bringing Clang as A new compiler in the Debian infrastructure. The various feedbacks that I had during Debconf were pretty good. It interests many people for reasons like Quality Assurance (more checks), performances, hackability or to decorrelate Debian and GCC. 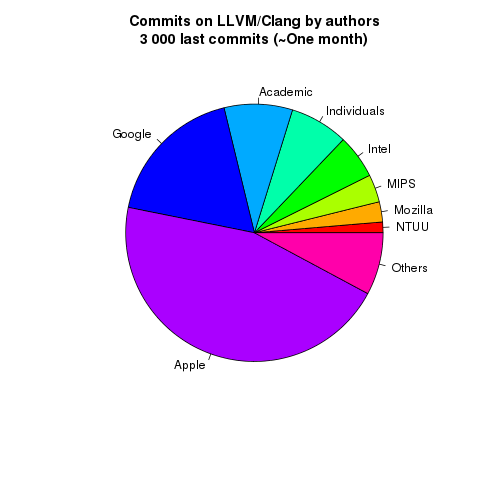 Who is in control of LLVM/Clang ? 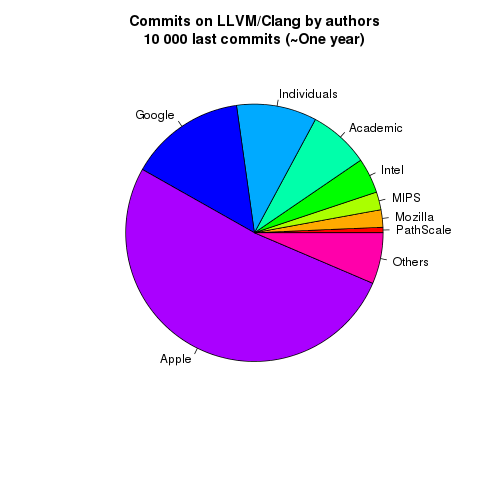 During my various chats and presentations on LLVM/Clang, one of the common criticism on LLVM/Clang is about the Apple's (supposed?) control on the platform. Even if I am not concerned by this concern, here are some statistics about the development. Basically, I used the git history to build a list of all the author. If domain names were clear (ex: @google.com, @apple.com, etc), I used them for the paternity of the commit. If there were not clear (ex: @gmail.com, @me.com), I dig on the web to find the employer (Linkedin was my friend). Of course, identifying individuals are pretty tough. Their percentages can be considered as a minimal figure. To sum up, we can easily see that the percentage of contributions of Apple is decreasing over the time. However, we all know that the number of commits is not the best metric to measure the control of one on a project. A couple weeks ago, I have been interviewed by the news site "Free Libre open source software for science and engineering" about Scilab and my work in Scilab Enterprises. Released a few days ago, I am happy to announce that LLVM and clang 3.1 are already available in the Debian archive in Unstable. RC versions were already available for the last few weeks in Debian experimental. They are very likely to be part of wheezy. We will soon try a new rebuild of the Debian archive with the version 3.1. Talking about clang, a couple of months ago, I proposed a GSoC project to extend the Debian infrastructure in order to use clang instead gcc to build Debian packages. The goal is not to replace gcc but it is more about building packages with a new compiler. With Paul Tagliamonte as co-mentor, Alexander Pashaliyski is going to work during the summer on this subject. For now, Alexander is working on an installation of the wanna-build and buildd services in order to have a dedicated testing environment. From February 17 to 19th 2012, between 10 to 30 hackers met at IRILL's offices to squash as many bugs as possible for the Wheezy release. Besides about 42 pizzas, more than one hundred bugs (104 to be precise) have been fixed. Among them, 18 of them were fixed by removing old/unmaintained/deprecated packages from the Debian archive. In a great atmosphere, one of the most important achievements of this BSP was that Yada, a deprecated packaging helper, finally passed away thanks to the efforts of Cyril Brulebois. Thanks for all the contributors for making of this week end a success.